Felix Bendish’s collection titled ‘Forbidden fruit’ showcased an edgy collection of accessories in handcrafted nickel-free metal and fabric embroideries. 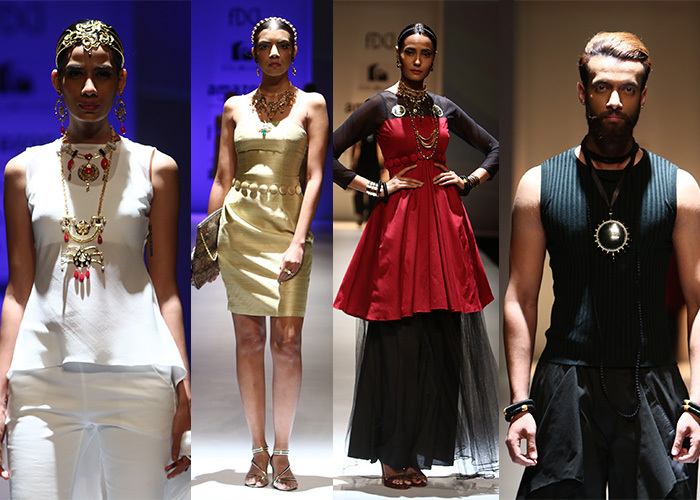 Each piece had a hint of the fabled serpent to highlight man’s fall from grace and his consequent awakening. 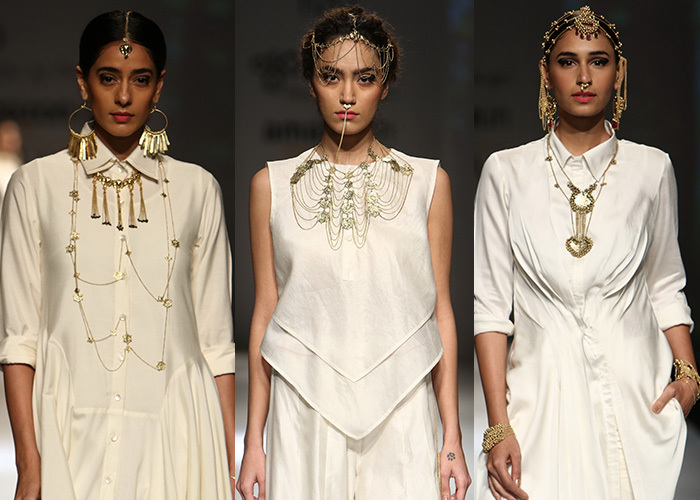 Ambar Pariddi Sahai revisited ancient treasures with her heritage collection. She showcased ostentatious jewels richly encrusted with ghungroos, jali work and vintage coins along with gemstones engraved with mythological symbols. 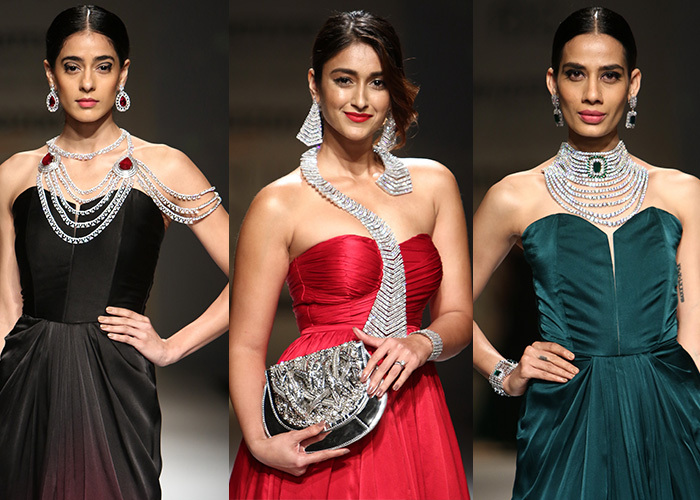 The Kolkata-based jewellery brand presented a perfect melange of classic and contemporary style. The intricately designed pieces studded with semi-precious stones and silver exuded elegance. The shoulder accessories were the ideal appendage to elaborate cocktail gowns by way of ushering in the festive season. Rehane’s collection showcased dresses in laser cut patterns and pretty beach cover ups in white and blue. 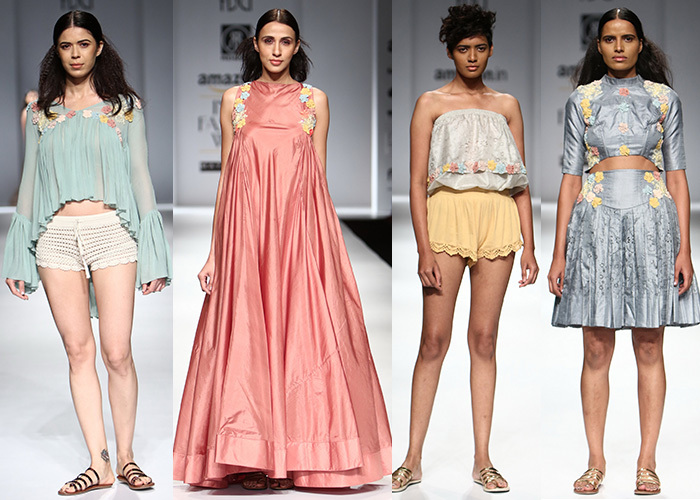 The free-flowing silk silhouettes in aqua and lilac captured the breezy mood of summer perfectly. 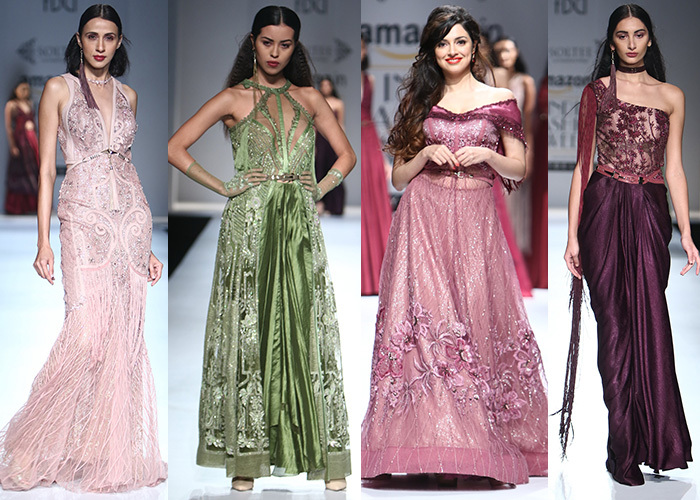 Sulakshana Monga showed a lineup of glamorous, floor-grazing gowns in moss green, champagne and dusty wine. While the cuts were form-flattering and feminine, we thought the gowns were overstuffed with details. The designer translated the vibrancy of Cuba into bold prints and geometric patterns with hints of strong military silhouettes juxtaposed with fluid shirts and relaxed bottoms. The vivid colour palette was the highlight of the collection with light olives and teals set off against military maroons and camouflage grays. 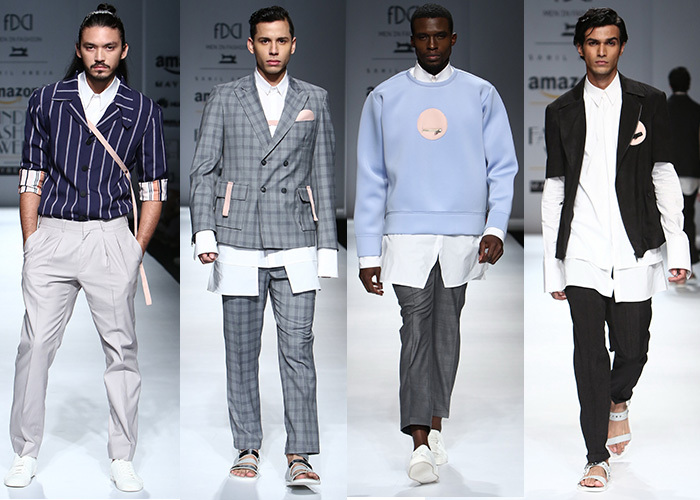 Pawan Sachdeva’s crisp summer line featured a classic palette of marble white, pewter, slate, azure and raven in organic textiles, pure cottons and twill blends. The collection also showcased layering favourites like statement bombers, light summer jackets and biker jackets. 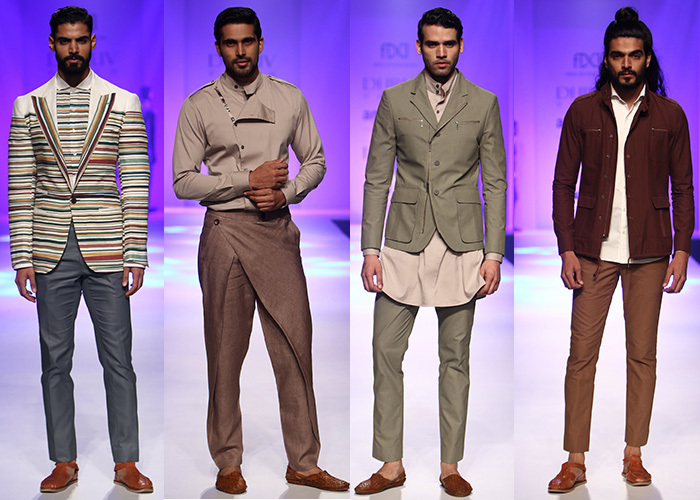 Sahil Aneja’s collection paid an ode to layering in a unique way with printed suits and shirts longer than the blazer. Checkered fabrics made a strong case as summer staples. 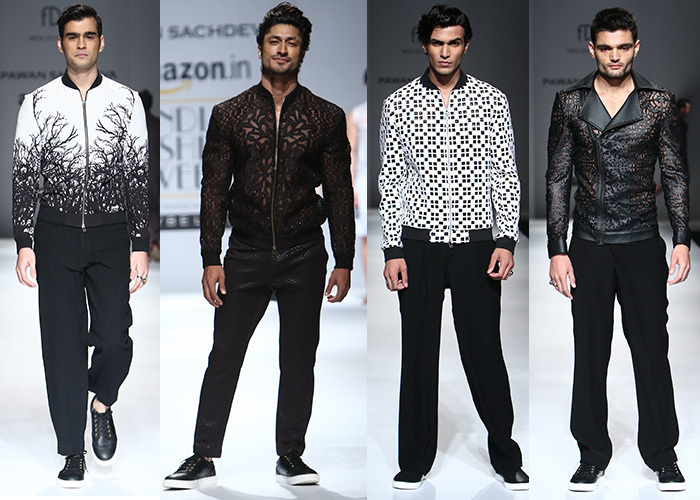 This collection saw the guru and the shishya come together on one platform. It combined JJ Valaya’s grandeur and opulence through the use of motifs and fine fabrics with Alpana-Neeraj’s restrained sculpting. Both these designers together offered pieces that were festive and modern in spirit and brought together two strikingly different sensibilities and contrasting aesthetics.